2. Fundus examination: The detached retina looks greyish white and raised above the surface, the retinal vessels are dark with no central light reflex, the detached retina oscillates with the movement of the eye, one or more holes are commonly seen in the upper temporal region, in total retinal detachment the retina is funnel shaped being attached to the disc and ora serrata, it is grey in colour. 5. 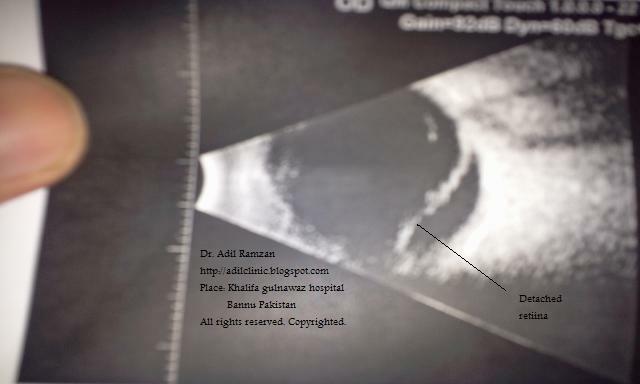 Ultrasonography (B scan): it confirms the diagnosis of retinal detachment in cases when retina can't be visualised for example, mature cataract, corneal opacity or vitreous opacities.